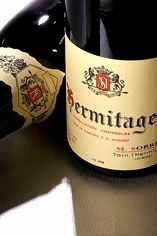 Attractive notes of spice, pepper and red fruits dominate Marc Sorrel's Hermitage Rouge but the ripeness of the fruit does not undermine a very complete and finely-tuned palate, discretely powerful but nonetheless engaging in its complexity. The Wine Advocate - Sorrel also produces two cuvees of red Hermitage, a regular offering as well as Le Greal (most of which is from Le Meal with about 10% from Greffieux). The dark purple-colored 2007 Hermitage offers sweet aromas of creme de cassis, graphite and subtle smoke, good acidity, a seductive, surprisingly forward style for a Sorrel wine and a heady finish. Drink it over the next 10-12 years.